Around 11am, we were at the dock in Killybegs, All packed up, it is time to do a few last interviews before I head to Dublin. 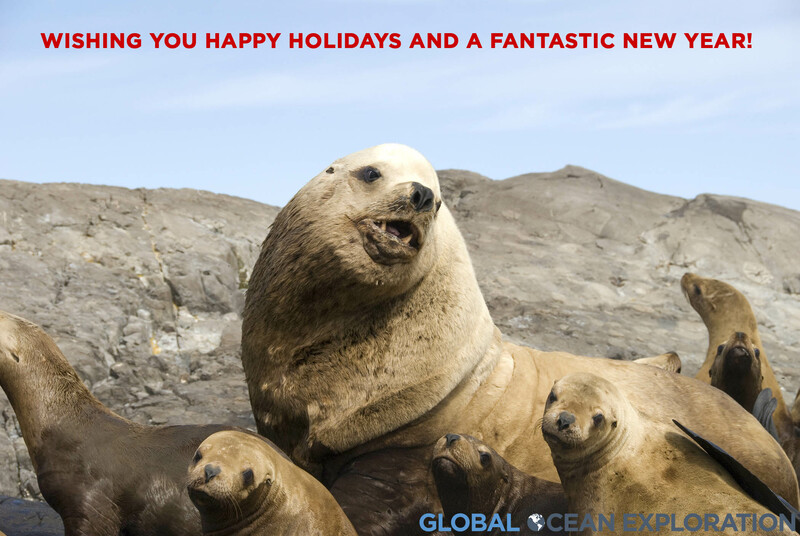 It is nice to be on land and reflecting back on a very successful expedition. This entry was posted in Arctic, Ireland, Salmon Expedition on July 6, 2009 by Gaelin. We continue to head south on our steam back to Killybegs. The weather has changed slightly with a low-pressure system to our south sending us some swell and winds. 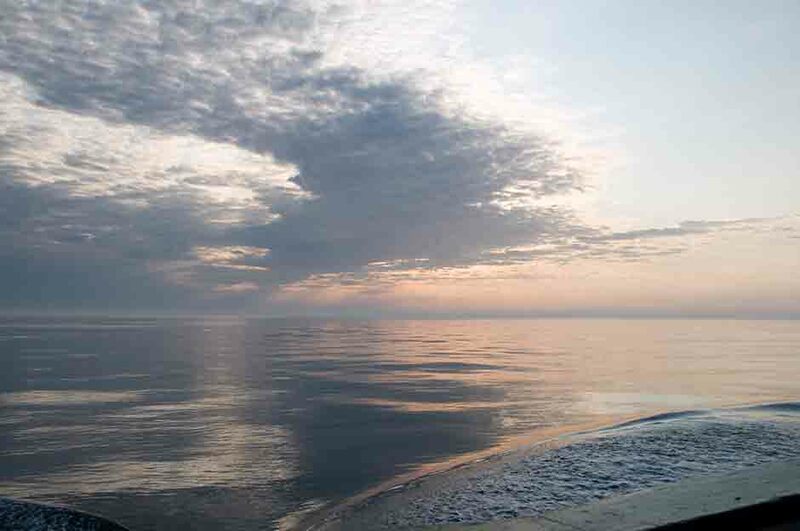 It is nice to feel the ship move a bit even though it is slight…it actually feels like we are at sea with the gentle roll of a swell. 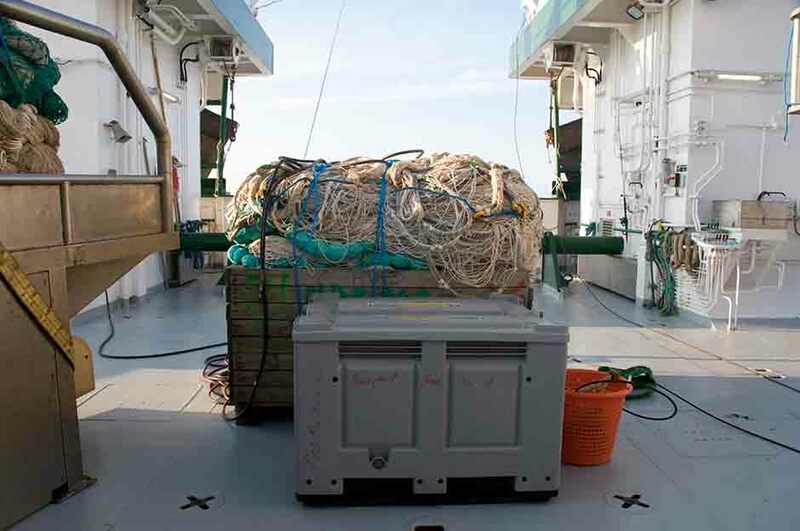 Packing up…The net is ready to be offloaded. The movement gave way to glassy seas once again in the afternoon as we passed by the Hebrides. The sun came out and glinted off the water and the distant islands making for a beautiful evening on the water. 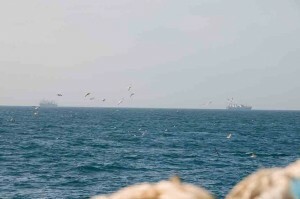 There were puffins sighted diving for needle fish around the ship. With nightfall, the first since leaving Ireland ten days ago, the Irish rains arrived. It is pouring outside so I don’t anticipate seeing the cliffs of Slieve League and the Irish Coast in the morning, but I will enjoy this final night at sea. There is something very special and magical about darkness at sea…it is difficult to put into words, but I think that all on board are welcoming this first darkness. We will be in Killybegs around midday tomorrow. This entry was posted in Arctic, Ireland, Salmon Expedition and tagged Hebrides, RV Celtic Explorer, steaming on July 6, 2009 by Gaelin. After a successful four days of sampling, we are heading back to Killybegs. 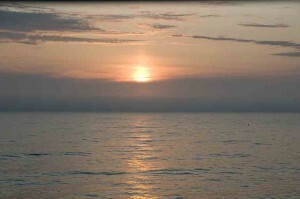 We have calm seas and light winds for our steam back. The sun was shining this morning but now the fog has once again rolled in. 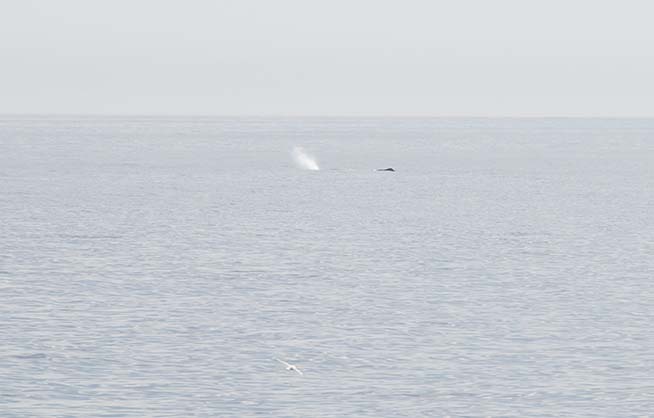 As we were steaming this morning, a large sperm whale cruised by close to the ship. The size and grace of these animals never cease to amaze me. 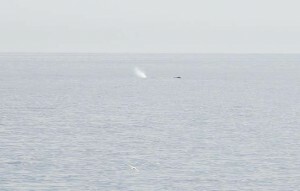 A sperm whale cruises by in the distance. This entry was posted in Arctic, Ireland, Salmon Expedition and tagged sperm whale on July 1, 2009 by Gaelin. 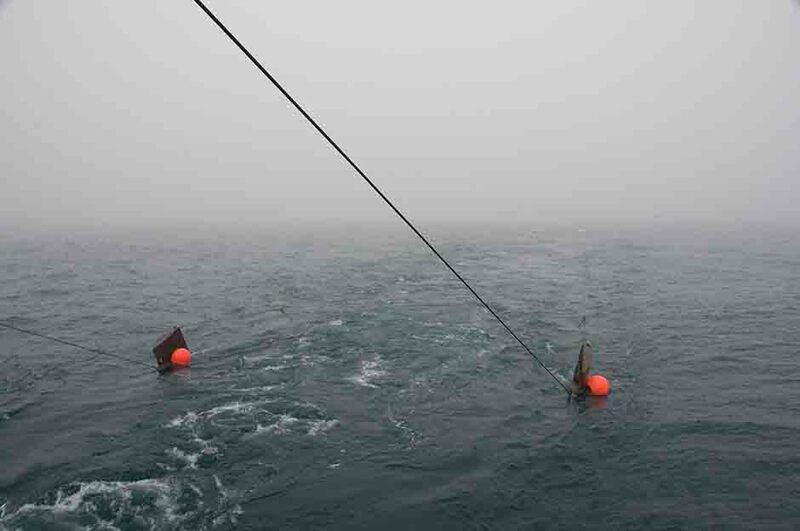 On this final day of sampling, we found ourselves back up north…farther north than before. 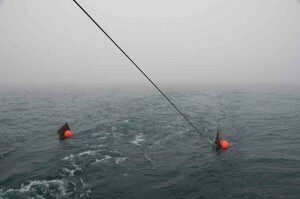 It seems that every day we steam north to start the sampling. 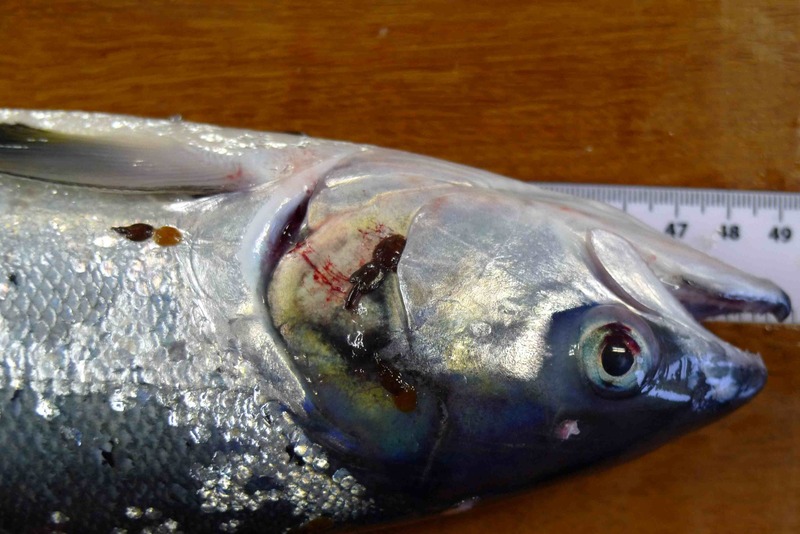 The reason for this is to keep up with the migration of the salmon post-smolts. They are funneling along the shelf here off of the Voering Plateau moving with the northerly current. 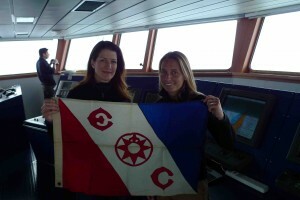 With the anticipation of heading back to port, everyone was excited to have a great day here on the calm Norwegian Sea. With the net in the water, the sun came in and out most of the day and finally stuck around for the entire haul of the last tow. With the sun shining, the birds were soaring around the ship and the final haul came in yielding a fair number of post-smolts along with an escaped hatchery fish. This adult fish was in very good condition but had been eating seaweed because it looks like fish pellets. 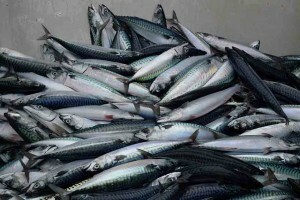 This is not a nutritious substitute for the small fish and plankton the fish should be eating. 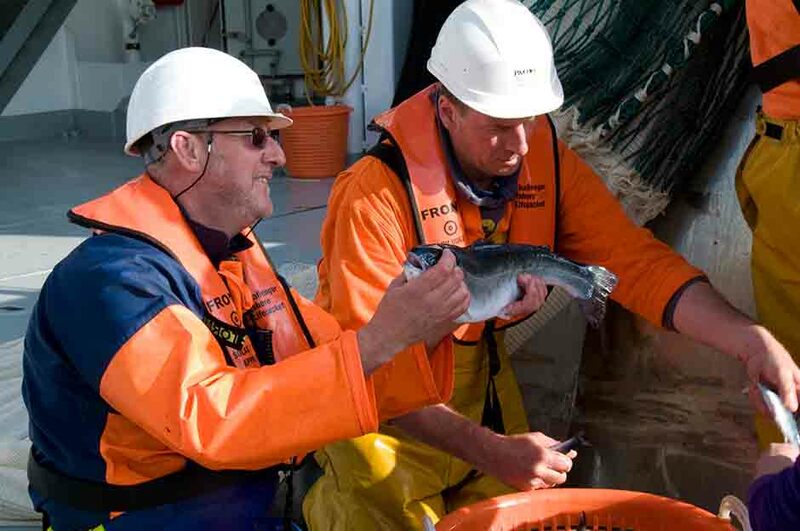 An adult salmon from the trawl. We are now steaming back to Killybegs from above the Arctic Circle. It should be a two and half day steam. Hopefully the seas will stay calm. The evening brought a beautiful sunset as we passed below the Arctic Circle. The sun disappeared behind a bank of fog before we could see it skim across the horizon as it would up here, but it was a stellar evening nonetheless. 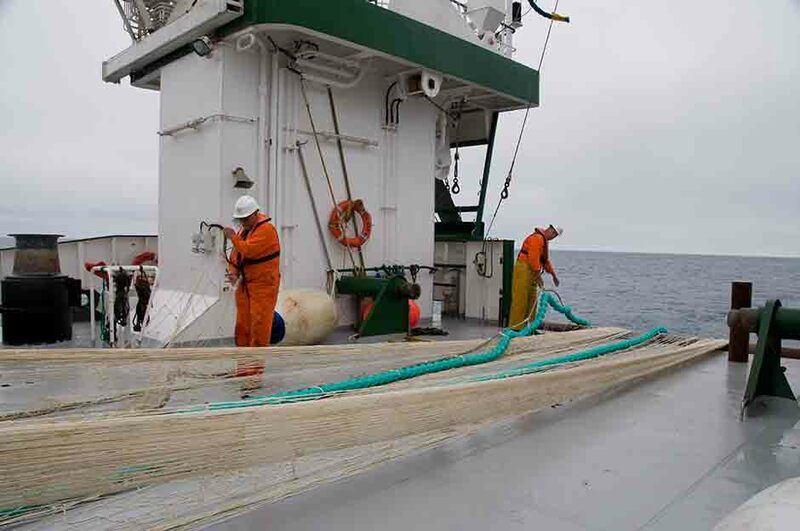 This entry was posted in Arctic, Ireland, Salmon Expedition and tagged Arctic, Norwegian Sea, salmon, trawl on July 1, 2009 by Gaelin. 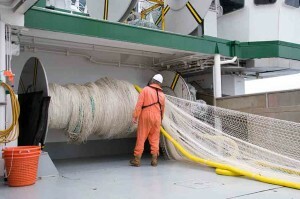 Trawls are commonly used to collect fish in fisheries research. They are also a very common way of fishing commercially for pelagic species (like the Russian trawlers we are seeing fishing for mackerel). 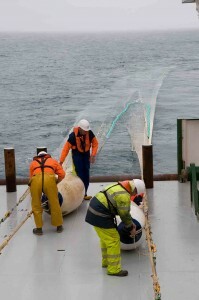 The trawl being used to capture the post-smolts is not huge like those on a commercial vessel and is designed to stay on the surface. The post-smolts tend to be in the top 3 meters of the water column. 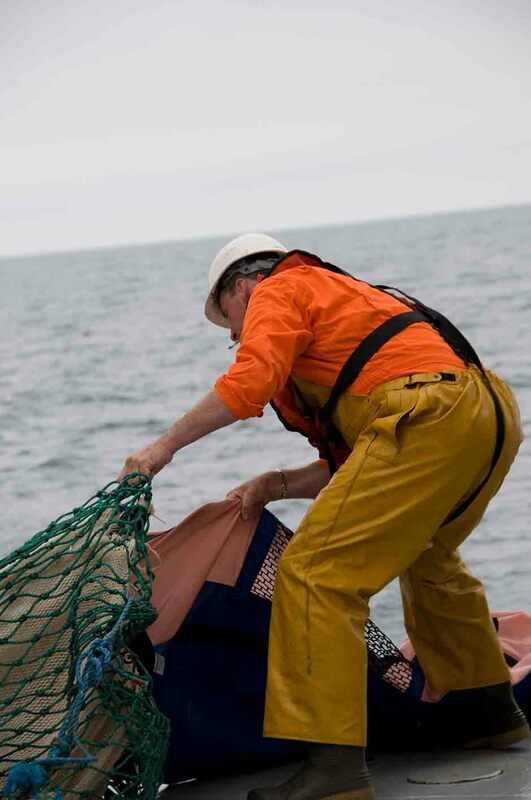 Fishing right at the surface reduces our bycatch as well. 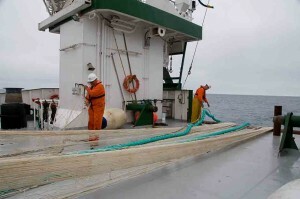 The trawl is towed for anywhere from one to five hours in specific areas to target the post-smolts. 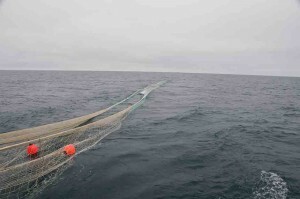 The net going out…the teal line is filled with floats to keep the net on the surface. 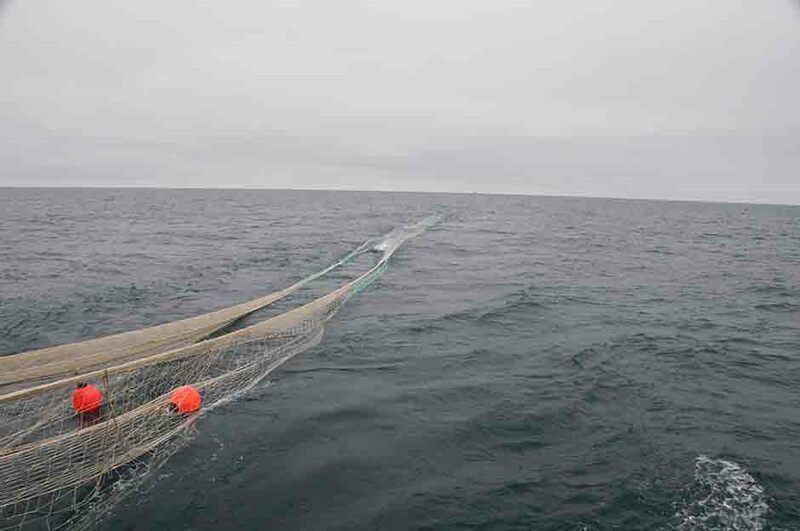 Floats are attached to the mouth of the net to keep it on the surface. Large steel doors keep the net open as it is trawled. 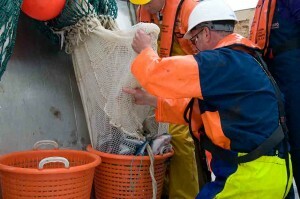 The cod end of the net coming on board. 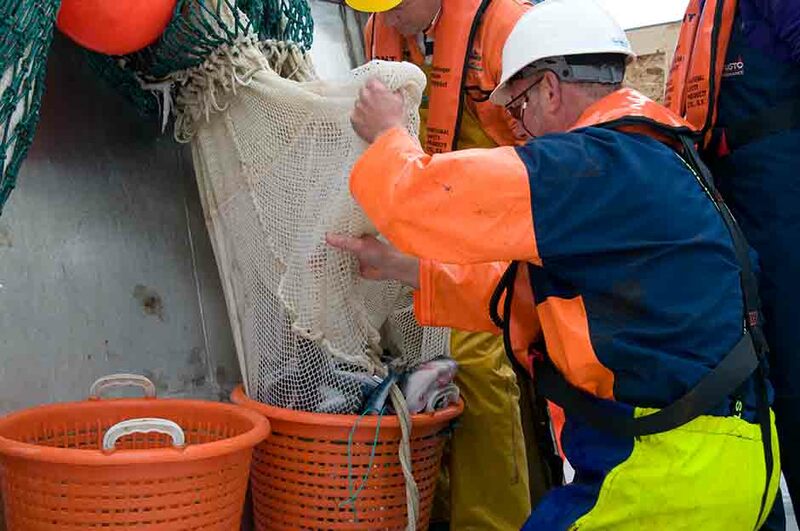 Emptying the cod end of the net…filled with post-smolts. 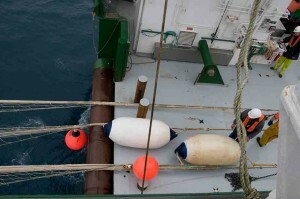 This entry was posted in Arctic, Ireland, Salmon Expedition and tagged salmon, science sampling, trawl on June 30, 2009 by Gaelin. Just as we thought we had hit our northernmost position, we turned back north and this morning arose to find ourselves at 68°10’N. The first haul of the morning was quite successful so the turn back north seems to be the right decision for finding the post-smolts. We got 50 in our first haul and now the next one is out so it should be interesting to see what we come up with. 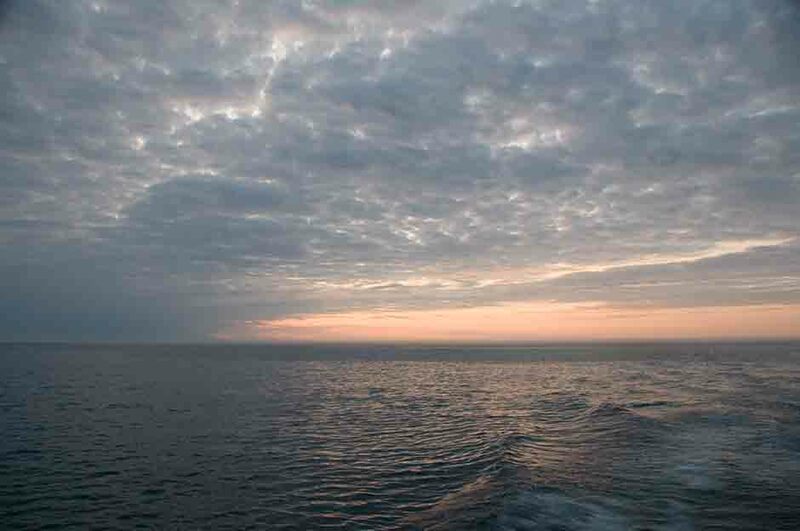 The seas are still smiling upon us, as it is calm. We saw our first glimmers of sun in a few days as well but we are in a blanket of fog. 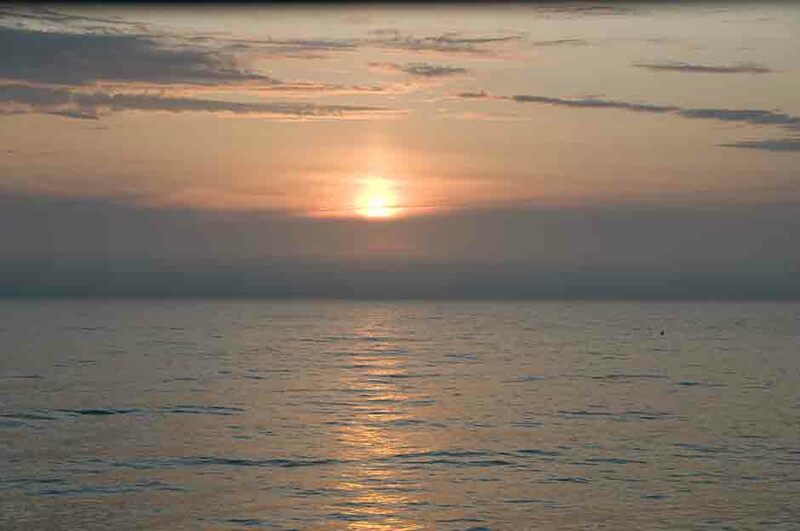 Hopefully by midday, it will burn off and we will have the perfect day at sea…this may be wishful thinking…I am quite satisfied with the calm seas and lack of wind. We came about for the second trawl of the day and headed back north in an attempt to stay in the high concentration of smolts. The numbers were not as good so we are heading back south. The floats of the trawl coming on deck. This entry was posted in Arctic, Ireland, Salmon Expedition on June 30, 2009 by Gaelin. This entry was posted in Arctic, Ireland, Salmon Expedition and tagged Arctic, Explorers Club, Gaelin Rosenwaks on June 29, 2009 by Gaelin.